"Blacky" is feeding on food being put out for the birds. Nikon D500 Nikon 300 f 4.0 PF +1.4x III. Cute eye contact. Our squirrels seem to eat more bird food than our birds!! Beautiful detail and terrific eating pose, Karl. The stone perch is perfect and complements the tones in the squirrel. Well done! Same here! 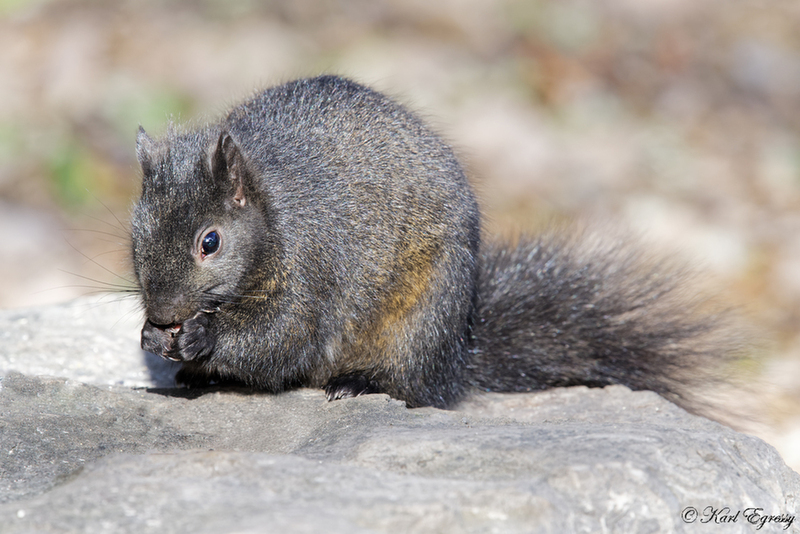 The grey squirrels even come into town after the bird feeders. Looks like yours is well fed, Karl. Nice detail when clicked on. Well that's one problem I don't have at my bird feeders here in the desert! Cute little guy, nice eye-level capture with a sweet pose. Very cute close-up- chunky little (well-fed) fellow. Nice setting. We are overrun with squirrels at our feeders too- red and gray ones. Never had a black here. I throw out cornmeal (cheap! )-that keeps them pretty happy (along with 15+ Blue Jays! ).